From the archives, Nicholas Lash reports on contintent-wide meeting of European theologians. A powerful article. I've copied it and will be re-reading often. A follow-up essay might explore why diocesan seminaries don't make these necessary distinctions. "No theological system can subsist if not permeated by love of its divine 'Object,' if it is not always nourished by dialog-that is, the welcome in the mind and heart of the theologian-with the divine Logos, Creator and Redeemer. Moreover no theology is such if it is not integrated in the life and reflection of the Church across time and space, Yes, it's true that to be scientific theology has to argue in rational fashion but it also has to be faithful to the nature of ecclesial faith centered on God rooted in prayer in a communion with the other disciples of the Lord guarenteed by communion with the Successor of Peter and the entire Episcopal College." Wonderful article. I plan to send this to the pastor of my parish. I think he understands the difference between instructing and commanding. If the hierarchy would read this and reflect on it, there could be hope for the future of the church. Unfortunately, I doubt that such a change in attitude is likely. This is a profound article and unbelievably timely to the Catholic church, not only in the U.S. but in the "Catholic" world. I pray that the Holy Spirit encourages the reception of the thought and concepts contained within, by the appropriate persons. the inisght of the writer is amazing. It is a wonderful statement of the way things should be. Of course, that will never come to be as long as the Church is not regarded as discipleship of equals where we all instruct, listen and guide one another. But the model of the Church that prevails in the hierarchy is military where the generals in particular the Supreme Commanding General orders and all others must obey. Luminous, seasoned, instructive, from a voice that carries great persuasive force in today's Church. How ironic that John Paul II gave such currency to the Stalinist language of "dissent". Powerful article, in part because of the simple clarity that suffices for Nicholas Lash to describe this Church problem and need. 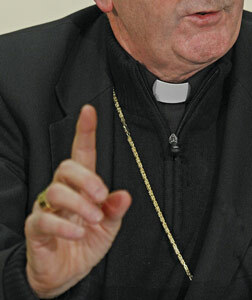 'We’re … teachers,' Archbishop Dolan said of the bishops’ role, '… the teachers'", on his election as USCCB president. Dolan Is Picked as the Leader of U.S. Bishops. The test of any teacher is what the pupil has learned. Consider what the bishops have managed to teach their pupils in recent decades on contraception, Mass attendance, confession, marriage, and loving _all_ the neighbors, for examples. No others would tolerate such demonstrable ineffectiveness where teaching and learning are important - in public schools, private schools, the military, etc. The military offers an instructive parallel to those who can learn. They depend centrally on obedience and (two-way) loyalty to achieve performance under duress, which ranges from the ultimate testing of combat to the mindless boredom of waiting. They vigorously study, teach, and practice both education and governance as if lives might depend on how well they do. Those who fail are removed. Would that Archbishop Dolan and his brethren could grasp Lash's straightforward analysis of their situation with similar understanding. "Wojtyla, a man who prided himself on speaking many languages, listened in none of them. But then no Pope in 2,000 years has been listened to by more and heeded by fewer. As the late Vaticanologist, Peter Hebblethwaite, remarked during the early years of this reign, "They like the singer, not the song." cf. David Yallop, The Power and the Glory: Inside the Dark Heart of John-Paul II's Vatican, page 680. Luckily for us, the same cannot be said about this author or the Jesuit whose work he was honoring. Yes, it's important to distinguish between teaching and commanding, but I think a great many modern American Catholics choose not to believe that the Church does both, and prefer to treat the commands as relics of an outdated theology and an ignorant and perhaps corrupt hierarchy. However, most teachers in the Church generally do not, I suspect, take the trouble to explain how it all fits together, choosing instead just to teach the Catechism. That could lead to a Church in which the only members are Catechism Catholics, content to obey without troubling much to think things through. If there is no room for the rules of morality to be discussed, but only followed, then the rules will never be taught or understood, only given as orders. This way of looking at moral rules and the law is no different than the concept of sharia law. Thinking of the rules and the law in this way is not Christ’s legacy. I believe that Christ’s legacy is Love which gives us the freedom and the means to place the law in its proper perspective, and gives us the freedom to question and understand the law in its full dimension including its limitations. This is not saying that disobedience is a virtue, but rather obedience is now cast as a means to listen and work at understanding (an education). "This is not saying that disobedience is a virtue, but rather obedience is now cast as a means to listen and work at understanding (an education)." The only command to be followed is a command to study and think? That sounds nice, but I don't understand where it could come from. I don't remember ever being taught to study - just to obey. In my limited experience, study isn't a particularly Catholic imperative, as it seems to be for, say, Judaism. Good article. You have to learn something before you can teach it. More importantly, some so-called truths in some doctirnes can only be definitely taught is there is reception. Reception does not limit itself to the laity but also to the clergy and the Magisterium. When the Vatican closes debate to many controversial issues of sexual ethics it ceases to learn and to listen. When a teaching is not recieved it does not mean it is wrong, but it does not call forth any power to change behavior. If the Church wants reception, debate should be open, not closed, and a solution to divisive disagreement must be formulated in the reality of cogent understanding and not in demands for obedience. Conversation, and its concomitant opportunity for enlightenment by another person's thoughts and opinions, is the route by which humans grow beyond themselves. When conversation is denied, one's world becomes a darker place. Witness the relationships in families. The bonds of familial love are damaged when, in the midst of a serious discussion over a difference of opinion, one person says, "Because I said so! End of discussion." Such ultimatums are an exercise of power and authority - a repudiation of the other - and a sign of dysfunction in the relationship. In the family of God, those ordained to lovingly shepherd souls to salvation do well when they invest themselves in conversation with the faithful, respectfully sharing their knowledge and gently guiding the people along the path. It is easy to issue orders. It is more difficult to be a true shepherd - but far, far more effective. "Pope Benedict just reiterated (December 3, 2010) the task of the theologian." In effect, do what I tell you to do. When I want your opinion/insight I will ask for it but reserve the right to absolutely reject it unless you tell me exactly what I want to hear. I respectfully dissent. If the role of bishops is merely to attempt understanding and agreement, then what happens in the great number of instances when the hearers fail or refuse to do so? Ecclesiastical chaos. Thus, the true role of the bishops is to educate and hopefully convince. If the hearers persist in their misunderstanding, the bishops must resolve the differences with a single magisterial voice. That's why we have bishops. Thanks for editing my post to make it totally unintelligible. (Post no. 17). Why did you do that? Mr. Lash misinterprets St. Augustine and shows his shyness in proclaiming truth. The consecration does not depend on the audience's approval to take place. Their "amen" is their personal acceptance and belief in what has already occurred by God through the priest. Further, the Magesterium does exist to teach and promote theological discussion - with the aim of generating a greater understanding of the truth. But it also exists to command - to clarify and correct ideas which stray outside the Faith. This is part of the Church's role and councils were convened in the past for this sole purpose. Lash demonstrates a lack of faith that there can be objective truth. With a nod toward Pilate's intellectual sneer, the preference in some circles is to let the pot of discussion simmer endlessly, never to achieve its end. Christ, through his life with us and the Church He established, came to establish truth so that truth might set us free from sin. Granted, a much better process to refine the truth should be championed. But the current truths, while incomplete, are essentially correct and must be accepted with humility in the knowledge that the full truth can never be known by any of us on this earth. I wonder if a modern Moses went to the mountaintop today, would he come down with the Ten Commandments, or the Ten Suggestions? Perhaps the reason that our bishops so often command and don't teach is because of the model they have for teaching. Many of them received their theological education in the large lecture halls of the Roman universities. They diligently recorded the lectures and fed them back at exam time with no opportunity for disagreement or dialogue. The professor commanded and they obeyed. The problem is that we, the educated laity, don't take to that style of "teaching." Approaching this intriguing question from an Orthodox mindset, one wonders what all the fuss is about. Bishops, priests, and laity are equally responsible to discern doctrinal and practical truths of the faith; the role of the bishops is to "rightly define the word of Thy truth" - as the priest intones during the Divine Liturgy - as a result of such a conciliar process. This article also appeared in print, under the headline "Teaching or Commanding?," in the December 13, 2010 issue.